Apparently a Mustang augured in. Saw some piccies of the aircraft just before it hit. The tailwheel was out and there was no sign of any pilot in the canopy, tailplane looked intact and there appeared to be no deflection on the elevator. Pilot was 75? Are you suggesting there was no pilot in the aircraft? No Boxhead, my suggestion was mebe he was incapicitated. Have seen pitchers since with the elevator trim tab missing, mebe ole mate tried to put the gear out to slow things up and only the tailwheel came out at that speed. Looks odd without a pilot filling the space. Looks also as though there will be calls to ban racing . Another prang today. This has video footage. 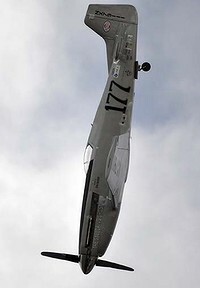 I wonder how much impact this will have on insurance and liability for airshows. It may get to the stage that only static and completely staged shows are affordable. yoo have a point Gus, we need to get more bottom feeders involved. With the news footage of the Reno crash there is a case for a class action for shock with anybody who saw the footage, heard of the footage, was told about the footage and read about the footage. Get your good friend QuoVadis (That's Latin for parasite?) to start the proceedings, won't be long and weel have those show off pilots grounded and airshows only a memory. It might actually mean "where are you going to". It looks as though more than the trim tab had come away to me. Would harmonic vibration possibly have assisted in the break up? It might actually mean "Scum of the earth". Purely speculative would be ole mate had an elevator trim tab come loose causing severe flutter. He pulled it up to slow the aircraft, a rooly steep pull up would black out a very fit younger bloke let alone a pensioner. Mebe he blacked out and was just along for the short final ride. No head in the cockpit would indicate that, also aircraft went in under full power. Yoo would think he would have pulled power if he was conscious. Have to ask Onslow when he gets back from racing his TS-11 ISKRA. These guys regularly pull high G, its part of the race. As for the aircraft breaking up, while they are ex WW2 fighters they are also extremely well looked after specifically because of their age and what they do in them. That being said it wouldn't surprise me if they were flown well outside of the envelope to get the best 'edge' and the airframes are not invincible. Long in the tooth also as the Parlour Talkers would say. Have to ask Onslow when he gets back from racing his TS-11 ISKRA. Yoo mean ask Tomato head, read somewhere that there was goen tobe an Orstraaliyan flying that particular Mustang till ole mate pensioner decided to havago instead. Lochlan the brave wool be back next day or two so yool beablta askum.